ANDRÉN & KNAPP - CROSSES, "Celtic Cross-Risen"
This is a small cross. 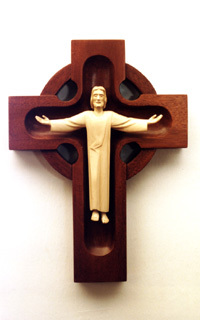 The idea of this design is that a Processional Cross could be made like this. The advantage is that the Risen Christ figure is somewhat protected by being in an indentation and is a little safer if the altar servers should accidentally drop or bump it.